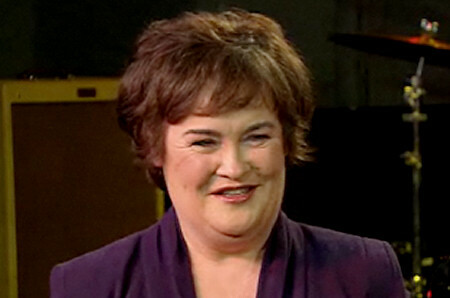 Susan Boyle is to be given an honorary doctorate for her contribution to the creative industries. The 'Britain's Got Talent' reject will be honoured by Edinburgh's Queen Margaret University where she studied for a certificate in caring. The degree is for work in society at large, which the university says reflects its commitment to the communities it serves. Susan achieved international fame with her television debut in 2009 when she sang 'I Dreamed A Dream' from the musical 'Les Miserables'. One YouTube clip of the performance from the Blackburn-born star has 21.5 million hits. Her debut album, 'I Dreamed A Dream', was at the time the fastest-selling debut album ever. With the release of two further albums, Susan has since sold around 18 million albums worldwide and has 120 platinum and gold albums across 38 countries. She has sung on television in the United Kingdom, the United States, Australia, Ireland and Japan, and performed for Pope Benedict XVI and the Queen. Susan sang live to half a billion people on the TV show 'China's Got Talent'. Also honoured in the university ceremony on July 6 will be psychologist Professor Colwyn Trevarthen, accountant Professor Ian Percy CBE and hotelier Norman Springford. Earlier this month Susan had an emotional breakdown at a motorway services area. Apparently she began screaming and weeping in front of shocked families following a stage performance of the 'I Dreamed A Dream' show that starred her in Manchester, England.